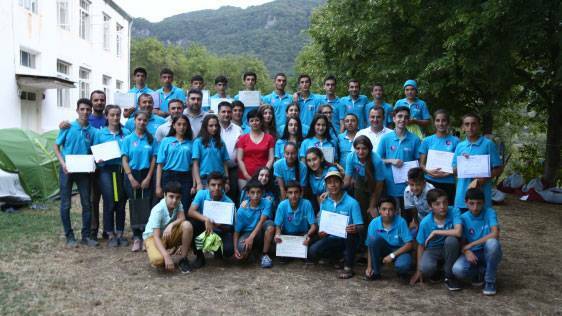 For the first time this year the 6th annual “DigiCamp” innovative camp took place in Artsakh, namely in Tsmakahogh village. The choice of the event venue was symbolic. Alongside with teaching the basics of innovation and entrepreneurship, the organizers of DigiCamp aimed to introduce the native village of the greatest Armenian engineer, physicist and inventor Andranik Iosifian to the participants of DigiCamp, inspire them to raise interest in rocket construction and engineering and in building their technological future all by themselves. A total of 52 teens in the 15 -18 age group from almost all over Armenia, including Artsakh, as well as Javakhk, participated in the event. On the first day of the 10-day camp the best 7 projects were selected, and then improved through teamwork of participants and with the support of mentors. Specialized courses were held by Ucom, Instigate, "World" Center for Strategic Research and other company representatives and individuals. Camp participants also gained relevant knowledge and skills from a group led by Vova Vardanov, the Founder of "Art of Survival" school, and a monument expert Samvel Karapetyan. Hayk Yesayan, the Co-founder and Director General at Ucom, also went to Artsakh to meet with the young entrepreneurs. Hayk Yesayan, who has also built his professional and career path from a young age, shared his experience in the field of start-ups with the camp participants and coached them. "The primary thing to take into account while financing a start-up is not only the project itself, but also the team working on it, without which nothing is possible. And, as far as all the teams here worked equally on the development of projects, we'll award the same prizes to all team leads. And the winning team will get a monetary prize of 350K AMD from Ucom to launch their start-up, as well as a 1-year subscription to U!Cloud cloud system," noted Hayk Yesayan, the Co-founder and Director General at Ucom. RAEEOD project, which has been brought to DigiCamp by a team led by Grigor Simonyan from Akhalkalak, was recognized the best and awarded the 1st prize by the jury comprised of the Minister of Education, Science and Sports of Artsakh Narine Aghabalyan, DigiCamp organiser, Union of Advanced Technology Enterprises (UATE) Executive Director Karen Vardanyan, Ucom Co-founder and Director General Hayk Yesayan, World Vision Armenia's representative Narek Tutkhalian and others: RAEEOD project is a music listening and search mobile app. The developers of all the 7 projects (RAEEOD music listening and search mobile app, "Who'll do your lessons?" computer programme helping students in doing lessons, which won the special monetary prize of the Ministry of Education, Science and Sports of Artsakh, Alarm Module for the front-line, Sportsman's Psychology mobile app, Armtour computer tour programme, TechnoGuide museum guide programme, Project Sapper minesweeper robot) received mobile phones from Ucom as a prize, as well as access to server domain required for implementation of their projects. It should be noted that DigiCamp is being held by the UATE since 2013 and is intended for young people, who have innovative ideas to share. Its key objective is to support and coach these young people, so as to help them develop their innovative projects and translate them into business projects. During this annual event students meet with the representatives of IT companies, discuss business ideas, work in teams on the development and implementation of these ideas, and at the same time participate in recreational and educational activities. DigiCamp is an effective platform for the students of "Armath" laboratory network, who gain knowledge during the academic year and in summer work with their peers in a business environment.